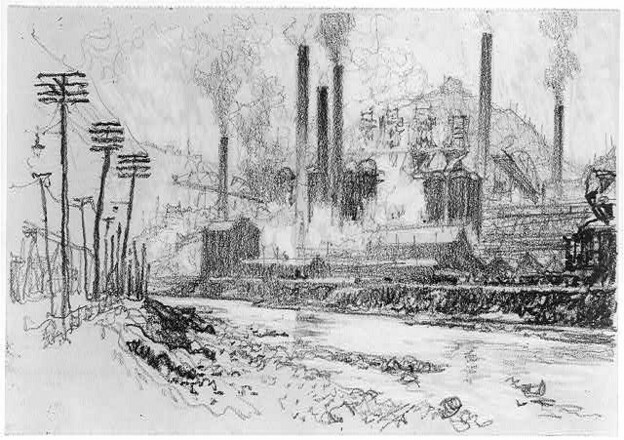 Joseph Pennell, drawing of Cambria steel works, Johnstown, Pennsylvania, 1917. Image from the Library of Congress. Published in 1905, when Jules Romains was twenty years old, “Poetry and Unanimous Feelings” launches one of his dominant themes: “unanimous,” or, as will be seen, “unanimistic” feelings. 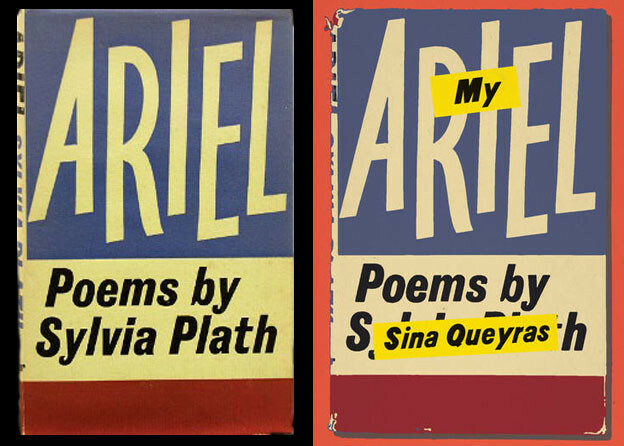 He will expand on the theme (theme-assemblage, really) over a lifetime, in poems, novels, plays, essays. To name, today, his articulation of the social and the aesthetic is a bit like trying to name a constellation’s mythological shape. The terms composing the constellation come from various discourses and have distinctly differentiated meanings and references: the crowd, sociality, the social, class, lumpen, group, mass, multitude, people, folk, gathering, audience, community, public, commune.… Connections between them can be made into more than one configuration. To favor one or even two would be to risk missing the fabled synonymy unifying them all. Is that Monoceros the unicorn in the sky there? A shape does emerge out of this heterogeneity when the terms are juxtaposed by one opposing phrase: nineteenth-century individual lyrical expression. Romains’s “doctrine” (as detractors called it) intended to unzip “the individual” into the social relations that compose it. Romains considered a momentous twentieth-century discovery to be that society constitutes the individual through collectivities — a discovery on the order of nature to that of the eighteenth century. Evidently, Romains likes to make lucid statements out of generalities (centuries); to continue in this spirit, his premise in this respect is a neoclassical one, that a whole is greater than the sum of its parts. The whole in fact is so much greater than its parts that Romains coined a word for it, unanimism, and unanimism is optimistic about a quality perceived in group behavior, unanimity. Every group acquires, consciously or not, a contingent but determinate identity which he calls its specific unanim. It will be a group of profound things welding together at once, a crescendo of ideas, each spontaneous and all of them moving in the same direction, like the spectacular rise of smoke that city factories deploy at the same hour. But unlike Imagisme, Unanimisme suggests that a whole is expressible not through particulars (the natural object is not quite the adequate symbol, as Pound said it was; ideas are not “in” things, as Williams hoped they were; the universal is not “in” the concrete, as USAmerican particularists — philosophers, poets, theorists, etc. — have variously argued); instead, like an ur-Poundian ideogrammic method, a whole emerges from relations between things, beings, ideas, effects equally. An early US review characterized Romains’s unanimism as producing “sociological poetry.” More recently, Rosalind Williams conceives of unanimism to be a “poetics of urban systems” of la vie sociale. A “system,” she says, may be comprised of interconnecting (of no longer dichomotized) organic and machinic relations in any environment, such as a street corner that today might consist of electric lights, oil spots, closed-circuit TVs, intersecting roadways, litter, dog poop, crows, storefronts, weeds, automobiles, sewer hole, iPods, and pedestrians. A unanim will show degrees of collective self-consciousness and institutional stability: poetry reading, coffee shop, cultural or political event, company, church, army, city, nation state. Romains writes that “unanims are more unstable, more supple, more capable of metamorphoses, of intermixing, of birth, of death than are our invariable and rigid selves.” The writer’s task is to help create unanims, and group consciousness about existing unanims. The city knows its dead are transmissions. what little they’ve captured of its immortal fluency. of their laryngeal systems; but tonight, they let go. with the vibration made by bodies underground. The dead and the dying are also able to participate in raising collective awareness of the unanimistic vibe. Unanimism holds a special place in Jean-Michel Rabaté’s argument to historicize globalization through turn-of-the-century imperialisms, the rise of finance capital, and the First World War. Rabaté suggests that unanimism was just as significant to early modernism as was futurism and cubism, and that in French modernist avant-gardes it polarized Apollinaire (for whom the avant-garde must focus solely on the medium of expression) and Romains (for whom the avant-garde also has a role of shocking into awareness). Romains’s widespread influence in European early modernist art, music, and literature is taken up also by Christopher Butler, while still others have examined specific unanimistic effects on texts by Joyce (the “wandering rocks” section in Ulysses), Woolf (The Waves), Pound (who acknowledged Romains’s effort to reinvent Greek epic chorus structure), Toomer (Cane), Waldo Frank (City Block), and Québec poet Jean Aubert Loranger (Les atmosphères), and on paintings by cubists, including Leger and Gleizes, and Italian futurists, including Boccioni (including his technical manifesto) and Carrà, among others. Critics have yet to consider the unanimism at play in other literary texts, such as Melvin B. Tolson’s midcentury Libretto for the Republic of Liberia. Romains’s mythological shape may also be broadly discerned in a constellation of contemporary texts that address social structures and collective identity, such as Renee Gladman’s The Activist, Carla Harryman’s The Gardener of Stars, Juliana Spahr’s The Transformation, Allen Fisher’s “crowd-out” texts, as well as in Teresa Brennan’s theory of the psychic transmission of affects, Hardt and Negri’s “social flesh” of “the multitude,” among numerous other theorists branching off from the group-consciousness-think of Freud and Durkheim (whom Romains called the Descartes of unaninism). In popular culture, the French film Delicatessen (1991) might be said to create an apartment building unanim. One unanimistic technique the film uses is a montage of scenes that repeats a rhythm unwittingly orchestrated by the squeaky bedsprings of a love-making couple: in back-and-forth movements of a worker roller-painting a ceiling, in a cello student practicing scales to a metronome, in a tenant manually pumping a bicycle tire, in a woman beating out carpet dust with a paddle, in fingers’ rapid movements with knitting needles. A still from Delicatessen (1991). Paradoxically, Romains wasn’t interested in creating a purely literary school or movement, not least one focused on technological novelty and analogy (to telephone, to radio, to airplane, to machine gun, etc.). By 1911–12, unanimism supporter Georges Duhamel could comment easily that literary schools were being founded every week. While Romains certainly wrote about unanimism as a rallying rubric for French writers of his generation, and was loosely associated with the Abbaye de Créteil group who were experimenting with communal living in order to write and to publish (their first publication was Romains’s La vie unanime), the very nature of unanimism would seem to prevent it becoming a strictly literary endeavour controlled by one platform or by one individual or group. Instead of another manifesto, Romains wanted to articulate all the new forms of social relation in modern city life. In a sense, this included the manifesto itself as a phenomenon. A manifesto, political or aesthetic, is often a performative claim made upon group consciousness (usually a manifesto has more than one signatory). The manifesto is a “crowd” mode of rhetorical address whose goal is to change another crowd-composition to which the status quo has become habituated. Romains takes self-referentially performative aspects of manifesto form and turns them into unanimism’s content: collective identity itself, group formation as such. Romain wanted to create group consciousness and to make others aware of what they were already collectively doing unconsciously, incidentally, expressly. But to what end, unanims? Unanims must by definition also include socially conservative and reactionary group expressions — those that might emerge from nationalist chauvinism as much as from anti-statism, and so on. The extent to which Romains’s theory and writing could constructively respond to the politics of groups seems limited. Unlike Eliot’s oeuvre — think Prufrock — Romains’s expresses an optimism about socially complex, modern city living. But like Pound (with whom, incidentally, he shares birth and death years, 1885–1972), the crises of the 1930s bring out another side to Romains’s theory. Even as PEN president, Romains’s unanimism racializes European identity as white, in what might be called a spirit of “goodwill racism” (goodwill is key to his conception of unanims as the title of his twenty-seven-volume novel, Les hommes de bonne volonté, makes plain). Without Pound’s enduring emotion in The Cantos of trolling paranoid vituperativeness and literary haughtiness, which repels (and paradoxically shields) his reader from the worst of his text, Romains’s teacherly tone of disarmingly intimate sincerity in the poetry book L’homme blanc (1937) is all the more discomfitting. Aimé Césaire buries (“buries” is his figure) unanimism by noting how in the 1950 French edition of Salsette découvre l’Amérique Romains’s use of a unanimistic technique — that of repeated implication-by-association in order to form a whole — oppresses. Certainly at other times Romains was aware of the “destructiveness of the crowd,” to use Canetti’s key phrase. During the Great War Romains wrote Europe, a booklength poem lamenting the destructive powers of unanims (army; nation; hero) gone awry — and predictably his response is to appeal to an even larger unanim than that of warring nation-states, indefensible (as Césaire would call it) Europe. The poem’s closing two lines — quoted above — appear groundlessly hopeful in the context of the poem. To not only articulate a unanim, but talk one down — the witch camps in rural northern Ghana (what are the poets in Ghana doing these days?) — or talk one up — the use of a repeated proceduralism that “unanimizes” a semantic field’s disparate references (something poets in Canada and the US are doing these days) — that is the groundless hope. We are all the martyr Ibrahim Qashoush. 1. Translations mine throughout essay. My translation of Romains’s manifesto appears in the “Manifestos Now!” issue (guest editor Brian Ganter) of The Capilano Review 3, no. 13 (Winter 2011): 46–48. Romains’s “Les sentiments unanimes et la poésie” first appeared in Le Penseur 4 (April 1905): 121–24. Reprinted in Claude Martin’s Correspondance: André Gide — Jules Romains (Paris: Flammarion, 1976), 152–54, and in Bonner Mitchell’s critical edition of selected French manifestos, Les manifestes littéraires de la belle époque, 1866–1914: Anthologie critique (Paris: Seghers, 1966), 81–86. 2. Jules Romains, Europe, 2nd ed. (Paris: NRF, 1919), 85. 3. Romains is cited in Rosalind Williams, “Jules Romains, Unanimisme, and the Poetics of Urban Systems,” in Literature and Technology, Research in Technology Studies,vol. 5, ed. Mark L. Greenberg and Lance Schachterle (London: Associated University Presses, 1992), 193–94. 4. Jules Romains, “L’unanimisme et Paul Adam,” Revue littéraire de Paris et de Champagne 2, no. 42 (September 1906): 284. 5. Allan Antliff details the influence of Romains’s “sociological poetry” on the Modern School movement in the U.S., in “Interpellating Modernity: Cubism and ‘La vie unanime’ in America,” in American Modernism Across the Arts, ed. Jay Bochner and Justin D. Edwards (New York: Peter Lang, 1999), 53–72. 6. Jules Romains, “La chevelure inextricable,” in Revue littéraire de Paris et de Champagne 2, no. 43 (October 1906), 352–53. 7. Jules Romains, La vie unanime (Paris: Mercure de France, 1913), 231–32. 8. Jean-Michael Rabaté, 1913: The Cradle of Modernism (Malden, MA: Blackwell, 2007); Christopher Butler, Early Modernism: Literature, Music, and Painting in Europe, 1900–1916 (Oxford UP, 1994); Renee Gladman, The Activist (San Francisco, CA: Krupskaya, 2003); Carla Harryman, The Gardener of Stars (Berkeley, CA: Atelos, 2001; Juliana Spahr, The Transformation (Berkeley, CA: Atelos, 2007); Teresa Brennan, The Transmission of Affect (Ithaca, NY: Cornell University Press, 2004); Michael Hardt and Antonio Negri, Multitude: War and Democracy in the Age of Empire (New York: Penguin, 2004). For an introduction to poet-artist Allen Fisher on “decoherence and crowd-out,” see the newsletter and supplement for PhillyTalks 19: Allen Fisher and Karen Mac Cormack (17 October 2001), with responses by Marjorie Welish, Matt Hart, Rob Holloway, housed at Slought Foundation Online. 9. Romains’s essay in Mitchell’s Les manifestes littéraires de la belle époque, 1866–1914: Anthologie critique (see note 1) is productively sandwiched between symbolist, futurist, socialist, humanist, “naturist,” classicist, and other manifestos published in France. Unanimisme is absent, however, from Mary Ann Caws’s international anthology even as it is three times the size of Mitchell’s, Manifesto: A Century of Isms (Lincoln: University of Nebraska Press, 2001). Unanimisme’s absence might speak to its questionable relationship to the idea of literary language as such — and therefore to the polarization between Apollinaire and Romains that Rabaté conceives as structuring French early modernism. “The limitation of Romains’ work, as of a deal of Browning’s,” Pound writes, “is that, having once understood it, one may not need or care to re-read it. This restriction applies also in a wholly different way to [Keats’s] “Endymion” [… and …] applies to all poetry that is not implicit in its own medium, that is, which is not indissolubly bound in with the actual words, word music, the fineness and firmness of the actual writing, as in Villon […].” See Pound, Instigations (New York: Boni and Liveright, 1920), 74. 10. Georges Duhamel, “Petit tableau des écoles poétiques,” Les Poètes et la Poésie, 1912–1913 (Paris: Mercure de France, 1914), 109–19. 11. Rosalind Williams, see 179n3. 12. Like Pound as well, Romains developed an over-inflated sense of his own social importance: in, for instance, the essays of Seven Mysteries of Europe (1940), he narrates himself into imagined key moments of European history before the Second World War, as advisor to French politicians and as a diplomat of peace. In fact, Romains supported the Munich Pact. Aimé Césaire lambastes Romains’s Salsette découvre l’Amérique in Discourse on Colonialism, trans. Joan Pinkham, intr. Robin D. G. Kelley (New York: Monthly Review Press, 2000), 51. 13. Elias Canetti, Crowds and Power, trans. Carol Stewart (Toronto: Collins, 1984), 19.